Instead of rushing through crazy crowds of people, why not spend the Friday after a gluttonous holiday getting ready for the duration of the holiday season with a tad more excess? If you’re in the cold weather as I am, I suggest avoiding the shopping malls and the windy weather and instead pop on some holiday music, pick out your favorite holiday movie and get comfy on the couch with a nice spiked hot chocolate! I suggest spiking with either Hiram Walker Peppermint Schnapps (a classic) or for those with a sweet tooth- Hiram Walker Whipped! Shake Whipped Cream Liqueur and Vodka with ice. Strain into tall glass over ice. Top with club soda. Garnish with orange wheel. It’s the first day of spring! While it definitely does not feel like spring (yes, CT got MORE snow yesterday) I’m ready to enjoy some springtime in my mind! I don’t care if it’s 32 degrees outside, bring on the springtime cocktails! The Whippsicle cocktail tastes just like the deliciously perfect for springtime treat: an orange cream Popsicle! If you still haven’t given Hiram Walker Whipped a try (where have you been?!) you should go check out how Drinking in America thought HW Whipped compared to Pinnacle, the results may surprise you! Find the review HERE! With Daylight Saving’s Time just a few days ago, I have found myself dragging through the days this week. While taking a mere hour away doesn’t seem all that bad, I am the type of person that needs every minute of sleep I can get! My sleepiness has me craving coffee, and Honey Bee’s Recipes has a delicious way to spike your cup of Joe using Hiram Walker Whipped. Check out her Coffee Cocktail with Hiram Walker Whipped Cream Liqueur and while you’re there I recommend taking a look at the other delicious recipes she has on there as well! Fabulous drink shot from Honey Bee’s Recipes! In November 2012 Kahlua introduced its newest innovation, Kahlua Midnight. Kahlua Midnight is a 70 proof mix of rum and black coffee liqueur intended to be served chilled as a shot for a night out on the town or at home with friends. I’ve been known to be somewhat of a night owl, I have been for as long as I can remember, but everyone has been in that position before when you’re out at a bar or club and the night is starting off a little slow (if you say you’ve never been there before, I’d like to come to your next party). With its sweet smooth taste, and a little jolt from the coffee, Kahlua Midnight is the perfect choice to take your party or night out to the next level, and celebrate what night owls like myself love: midnight! Shake with ice and strain into shot glass. Top with Whipped Cream and Sprinkles. 3 Must Have Thanksgiving Drinks! 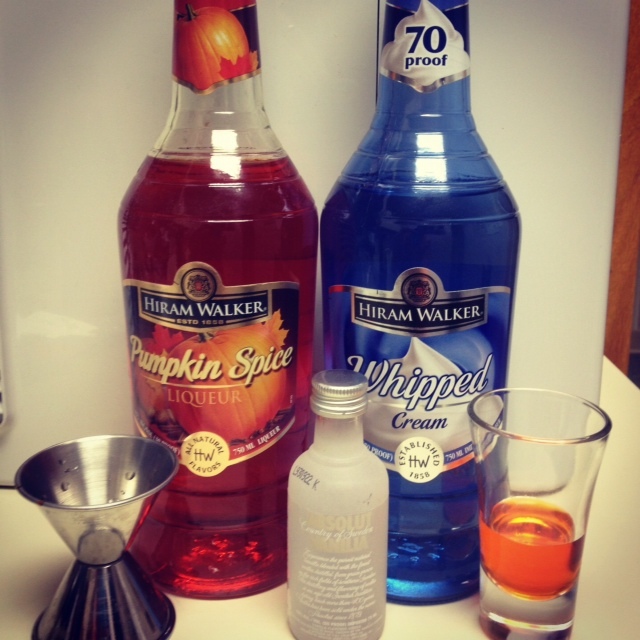 Hiram Walker Pumpkin Pie Martini, perfect for Thanksgiving! Combine ingredients in shaker w/ ice. Shake vigorously. Strain into martini glass. Garnish and serve. The CosmoWHIPolitan: If pumpkin isn’t really your thing, this sweet treat is the perfect drink to accompany a day of feasting. Shake all ingredients in shaker and strain into chilled cocktail glass. Garnish with an orange twist. 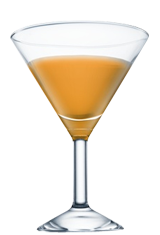 The Pumpkintini: If pumpkin is your thing, but you need to save more room for the actual dessert, this martini is a little less sweet than the Pumpkin Pie Martini…but still delicious! Shake and strain into a martini glass. Sprinkle with a pinch of cinnamon. This Friday I am back in New England and back in the fall mindset. In a couple of weekends I will be getting together with some friends from college for our annual pre-Thanksgiving, Thanksgiving Feast, and this year I was put in charge of making “festive cocktails”. While I am much more qualified to play bartender than Iron Chef, there is still a lot of pressure that comes with providing party refreshments. To ensure I don’t ruin the whole fun of the evening, I have forced my co-workers to be my guinea pigs for the next few weeks while I test out a variety of “festive” cocktails to prepare at pre-Thanksgiving. This first creation was inspired by one of my college roommates who is an avid baker. We all have her to thank for the wonderful desserts at pre-Thanksgiving (and for those last 5 pounds I could never shed at school). One of her most beloved baked goods is her secret family recipe for “Fluffy Pumpkin Pie”. I am told that a Fluffy Pumpkin Pie becomes “fluffy” when some sort of whipping takes place (like I said, I’m not the baker) and this inspired me to do some “whipping” of my own to create a “Fluffy Pumpkin Pie Cocktail”. After playing around with some recipes, I decided that this creation was better off as a shooter (it’s a little too sweet to be served as a martini), and with my co-workers’ approval I will be serving these shooters at pre-Thanksgiving. Shake ingredients with ice. Strain into shot glass.